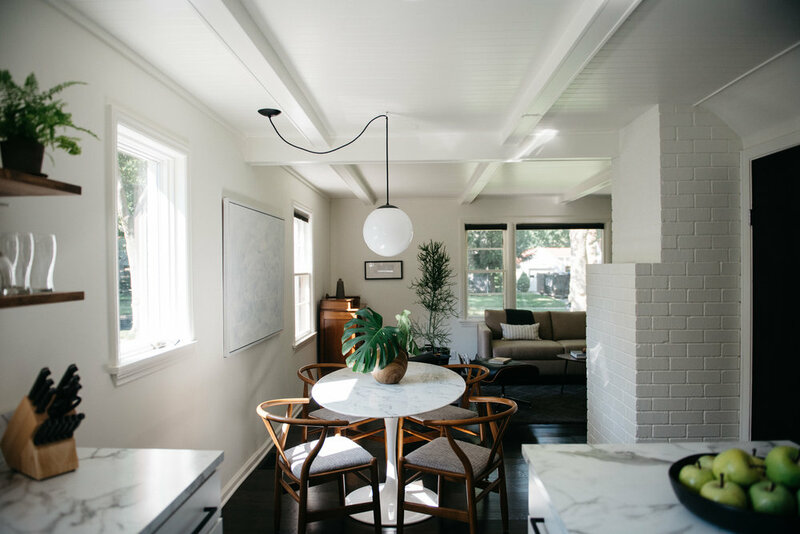 While drab in color and mostly hidden by an overgrown landscape, this classic bungalow was well suited for a makeover to make it worthy of its Westside tree lined street neighborhood. Originally built in 1951, this traditional cape cod bungalow had a few hidden mid century design elements that acted as a catalyst for the soft modern makeover. The brick was updated with a soft white paint, windows and doors provide depth to the color palette in a rich, warm grey and the gutters were turned a copper tone to connect the brown/tan roof. A fresh modern landscape with an integrated cedar planter and entry stair create a warm welcome. Walls came down and doorways were widened to create an open concept living/dining/kitchen space which also allowed for a full circular flow through the main floor. A screen porch was turned four season to add a flexible lounge/back entry/mudroom space, while acting as a connector to warmer season indoor-outdoor living. The second floor was made more a part of the house as a whole by opening the stairway and with the addition of a bathroom, the second level is not home to a owner's suite. A mid century beam and v-groove ceiling add interest and a sense of architecture to the newly create living space. The opened spaces are now connected with an updated wrap around brick fireplace. 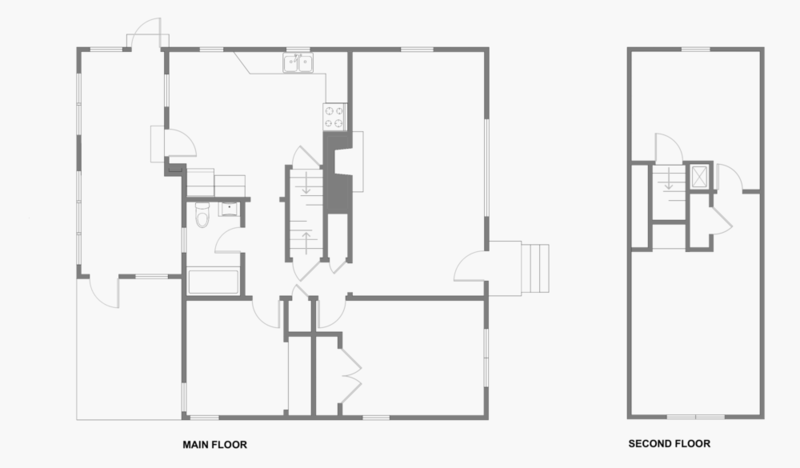 To really make the floor plan of this home work the kitchen needed to move. This before and after explains it better than words ever could. The kitchen design, while compact, does not lack in function and is now an integrated part of the overall home. A simple black and white color scheme throughout brightens and simplifies making spaces flow naturally and appear larger. The simplicity of this makeover continue throughout the landscape on this project. Rectilinear lines create walkways, decks, patios and planting beds. Connecting the feel of the front and back yards and pushing an otherwise typical cape cod to the modern side. Before the second level for closed off and probably forgotten about. Now with the stairway opened there is a natural connection between the two levels. What was once a not-very-enjoyable-sort-of-screen-porch became a full four season space creating a back entry area with storage and a small lounge space to extend the main living space and act as a better connection to the back yard. For more of the finished spaces in this renovation visit the project gallery.